Fundraiser of the Month | 5% More Profit! | Up to 55% Profit! Fundraiser of the Month - 5% More Profit!!! 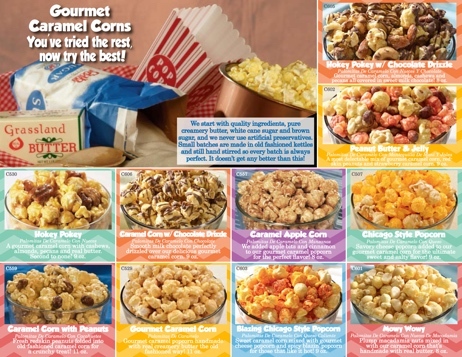 Gourmet Caramel Corns . . . made the old-fashion way by hand, in copper kettles with real Grassland Creamery Butter! (Below . . . view 6 Delectable Flavors or Varieties in 14-16 oz. tightly sealed bags . . . popped fresh, with and without a wonderful variety of most flavorable, freshly roasted nuts!!! -- All . . . Great Snacks to satisfy the craving of all of your ‘sweet teeth’. -- You just simply cannot beat these ‘mouth-watering’ delicious delights!!! 200-749 Items Sold -- Profit: 40% + 5% = 45%! 750-1,499 Items Sold -- Profit: 45% + 5% = 50%! 1,500 & Up Items Sold -- Profit: 50% + 5% = 55%! 5% Extra Profit Included below . . .